Locusts are members of the grasshopper family, and like those familiar garden insects they have long hind legs used for jumping. Unlike their grasshopper cousins, however, locusts can change their physical appearance and behavior, morphing into massive swarms that move as a single unit. Of the more than 8,000 grasshopper species, only about 10 have this unique capability. Locusts are normally solitary and actively avoid contact with each other. But when conditions are right, particularly after lots of rain, contact becomes unavoidable. As the insects bump against one another, they begin to change. In an hour or so they become attracted to each other and swarm together. During the course of one or two successive generations they actually change in shape and color, becoming bold yellow or green rather than the neutral brown of solitary locusts. These two phases look so different that until the 1920s, scientists believed they were actually two separate species. Only adult locusts can fly. Immature locusts, known as hoppers, form bands that move together by bounding across land as a single unit. While weather provides optimal conditions for breeding and feeding, bands and swarms aren't formed by population density alone. When locusts rub against each other, the contact increases serotonin levels. The normally shy and solitary insects become social and crave more contact with others. Scientists discovered artificially increasing locusts' serotonin levels in a lab environment caused the transformations in appearance and behavior seen in swarm development. In contrast, blocking serotonin kept the insects calm despite contact with others. 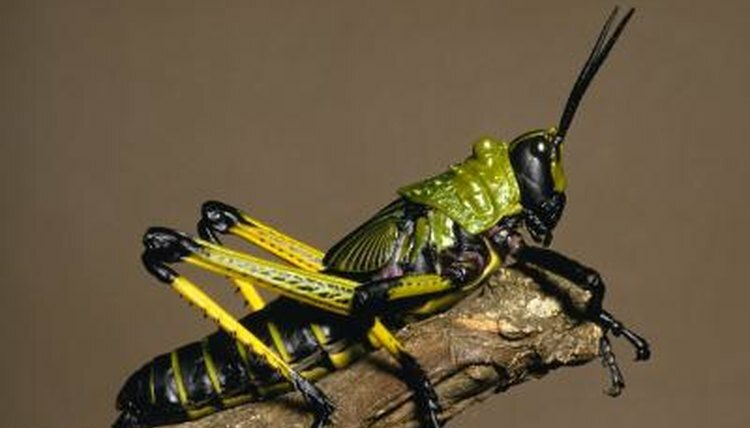 Locusts differ from other grasshoppers in their ability and tendency to migrate far and wide in search of their next meal. When they change into swarming locusts, they also attain the ability to adapt to a wide variety of habitats and food sources, making geography no barrier. These massive swarms travel as many as 100 miles a day. In 1954, a swarm of locusts flew from Africa all the way to Great Britain, decimating crops along the way. Another swarm in 1988 made it from Africa to the Caribbean. Although swarms of biblical proportions are less likely in modern times due to pesticide use, six major plagues have occurred in the 1900s. One of these epic plagues persisted for 13 years. One locust species, the desert locust, is particularly notorious for producing swarms that can cover as many as 460 square miles. A swarm that large would consume 423 million pounds of plants every day. To put this in perspective, a swarm the size of New York City would eat as much in one day as the human populations of New York, New Jersey and Pennsylvania combined. Plagues of this size don't develop overnight, but require several months of optimal breeding and feeding conditions.